Click Here for the Portuguese Version! When he entered the place, the setting sun was casting an aura of martyrdom on the saints that had been immortalized in the colorful stained glass windows. Filtered through the glass images, a faint light of mixed colors bathed the nave of the church, giving it a sacred, solemn atmosphere. He was welcomed by the warmth of that hot environment as soon as he took his first steps, as if something old and sandy had caressed his skin. His pores reacted to the heat of that February day, responding with a cold sweat running down his back, making his shirt cling to his skin. He thoroughly believed in the speculations that at last had brought him there. He was also sure of the actions he would eventually take from then on. It was precisely because of his certainty that he disregarded his anxiety as partly responsible for the sweat that seemed to torment his body. Hot like hell! he finally cursed, using his thumb and index finger as tweezers to shake his shirt by the collar, trying to capture a little bit of cool air. Ironically playing with the notions of heaven and hell, the temperature seemed to be even higher within that sacred, yet poorly ventilated territory. That kind of inconvenience made believers avoid pilgrimage sessions during peak hours—that is why the scene he encountered was a perfect match for what he had envisioned days before. Sprinkled on the large pews, a few sinners and other forsaken souls were perched before the altar. Now, looking at them, he realized that only two types of sorrow could force anyone to humbly show such fervent devotion, regardless of any discomfort: If not for guilt, they had come due to desolation. The promise of pastures did not motivate stray sheep, but they will come when only naked lands remain, he thought. He watched them in contempt and suddenly understood he hated them. He had chosen the right time, after all. His firm steps echoed as he walked down the aisle, turning right just before he reached the altar. He stood there, unnoticed by most believers and non-believers who were making too much effort to relieve their own pain and had become unaware of their own surroundings. He could then go on walking absentmindedly along the transept toward a hardwood structure with carved flowers that was sitting at the end of the annex room. The piece of furniture had a main compartment with a door engraved with a large cross, and a side compartment surrounded by a heavy purple curtain made of velvet that hung in a half-circle from the upper part of the main structure. Despite the incompatibly sophisticated nature of the piece, its strategic position in the shadows of the church assured the proper secrecy for its intentions. At that moment, the curtain was closed, isolating secrets unknown to the rest of the world. Luckily, as soon as the man got closer, a stout lady with a curved back and rough features slid the purple fabric to the side with her dry hands and stepped out of the confessional. She smoothed her long gathered skirt, straightened the scarf that covered her head, and left weeping in controlled sobs. She didn't even notice the man a few steps from her. Unaware of their surroundings, he reminded himself, unable to control a smirk that fate had brought to his lips. He glanced back over his shoulder while walking toward the confessional. He hid behind the twilight of the curtain and was finally away from the world outside. He was in a new universe sealed by the perimeter of the purple fabric. His toes found the edge of the little bench and he knelt down, resting his head against the grid that separated him and the parish priest. Following his instincts, he cleared his throat in an attempt to make his presence known before he started speaking. “May God bless you, my son,” the clergyman replied from his side of the wooden cubicle. Despite the low demand from believers during summer, the simple-mannered parish priest with tired eyes remained faithful to his ecclesiastic duties. An advocate for fasting and observance, the taciturn priest was well-known in all neighboring parishes—both by the priesthood and members of the community—as a well of wisdom and serenity. Many sought his comforting words when faced with a problem and truly believed in absolution if he had declared the penitence. Everybody came to this priest for his knowledge, and it was for his knowledge that the man had come to him. “Tell me, my son, what sins do you wish to confess?” the father continued, ceremoniously. That last sentence, inoculated in spitefulness, made the old man momentarily numb. Once recovered, he got so close to the grid that his nose almost touched it. He squinted to try and see the face that was hiding in the shadows on the other side. “He gave us eternity. Simple as that. Nothing more. Nothing less,” the man said slowly in a joyful whisper. With such impactful revelation, the priest backed away from the grid that separated him from the stranger, noticing he was treading dangerous waters. Dangerous, not for the waters, but for the company it brought. For a few moments, they could only hear the believers outside reciting “Our Father” at the altar. Surely the man was smiling on the other side of the lattice. “And will you devour me too if I fail you,” the priest retorted. To the priest's ears, every sentence being uttered sounded like a bear trap. He needed to be careful where he stepped. Disconcerted, the priest denied to himself that he had agreed with any of the ideas proposed to him. He recalled what he had said in the beginning of the conversation. I will understand you, young man, even if I don't agree with your theory. So far, he had not deciphered the man and, on top of that, he was afraid he was not longer sure of the second part of his conviction. “I must say that, even though I do not agree with what you just said, I can tell you it is fascinating. I can see you are a thinker, my boy. You could make a big difference in this world if you applied all you have in different way. This path you have chosen will only make you waste your energy. You see, I'll say it again: It is indeed fascinating, but there are no foundations to this structure you have erected. For example, you seem to be underestimating the amount of mystery that exists in the cosmos and in life. They too are infinite,” the priest said, with a victorious air. “Well, so you shall remain in paradise without seeking any knowledge. Spend your days playing the harp with cherubs and you will not be in danger,” the clergyman gave the sentence tensely upon witnessing his two counterarguments being refuted so easily by the stranger, as an expert putting aside an exhausted subject. “Now, you are being a little simplistic, father. Knowledge is not solely acquired actively. A large part of it sneaks upon us and reaches us passively. Please join me in a fictional experiment. Let's take the average country man as a guinea pig—or as a subject, if you so prefer—, the kind of man who barely learned his ABCs at school. We have many of them here... Well, let's imagine now that, for the entirety of his existence, this man was confined to an isolated plot of land, free of any influence from the outside. Apart from the air-tight nature of his isolation, he is like many men we see around here. Do you believe that, by the end of his life, this man will not have learned a thing? I suppose you would agree with me that, years later, he would have learned the best time to sow and harvest and, with a single glance, he would be able to predict whether the wind will bring any rain. This is all knowledge. Primitive, crude knowledge, but knowledge nonetheless. Here's the fantastic part of this amalgam that I insist in bringing to you, so you can see that it will make a world of difference: Existence! I will tell you, without the shadow of a doubt, that in his eternity this man, this simple man who is merely subsisting, will think about everything that has been thought of by Plato, Voltaire, and Confucius. He will recite the complete works of Shakespeare and Borges by heart, just as well as all those cheap novels that come with obscure newspapers. When you are not limited by time, all possible combinations of sentences and thoughts shall occur to you! Within the limits of the universe, this very same man would have conducted an autopsy of creation itself. Baffled, the religious man would rather not to question his own convictions, which were unshakable, but to press the intentions of the young man, for those were most disturbingly emblematic. “The toll highway to hell charges a high price, my son. Do not say such nonsense! Believe in the Father and take all your distress to Him, for he will remedy it. What you are saying is blasphemy, something beyond your comprehension. You do not seem to be the type that deserves hell. You are only lost in your madness. I shall convince you, my son, I must convince you!” the religious man was panic-stricken and feverishly raised his hands toward the ceiling of the cubicle. Upon hearing his death sentence, the bony legs of the clergyman started to shake ever so vigorously. A shriver ran down his spine and made his limbs tingle, like hundreds of icy spiders crawling all over him. His heart was racing and seemed to compress his lungs in such a way that he was soon out of breath. “No, my son. No! Listen. Listen to yourself... It's madness! Oh, it is madness that has taken a hold of you! Do not destroy your life with the aberrations that live in your head. If you shoot, soon the believers outside will hear it and call the police. No, do not throw your life away!” the priest pleaded for his life, sitting back on his bench hidden inside the concessionary. Despite the lack of light, he could now swear he saw a metallic reflex in this direction. “Oh, God! Sick! You are sick! For the love of our Virgin Mary, stop this madness! Alternative? There is an alternative. There are several alternatives. My son, suicide is an abominable sin. It means rejecting the life that was given to you by God. Killing yourself will lead you down the path you wish to follow, yes. But, please, do spare my life!” The sniffling cry of the priest brought some moist to his dry mouth after his tongue had stuck to the roof of his mouth, reminding him of his worst days in fasting. “No... No... No! Think, think. Oh, yes... Do you believe in reincarnation? We, as Catholics and Christians, deny the existence of other mundane lives. However, we cannot impose truths to the after-life, can we? Can we? Many religions talk about it. In India, they even worship those cows! Cows! Haven't you seen those spiritists and their regressions? That is your way out, young man, that is your way out! Do not fear, because after death comes oblivion, which will open the door to a new life experience. Therefore you will never ever be able to achieve complete knowledge,” the clergyman at last completed his thought, cyanotic. He was gasping for air, taking deep breaths. His urgency was so overwhelming that he did not even mind the humid warmth running down his legs. He became a surgeon dentist in 2009, but has remained passionate about books. 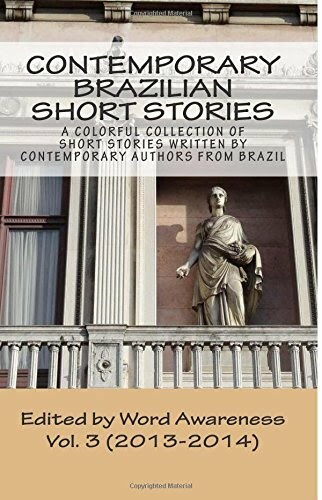 Today he publishes his writings on Recanto das Letras [Nook of Letters] and takes part in literary challenges promoted by Entre Contos.